In the remote high desert of New Mexico, Acoma Pueblo sits 400 feet above the desert floor on an isolated mesa as it has done for nearly nine centuries. 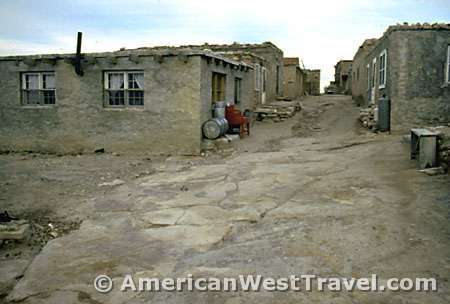 Aptly nicknamed the “Sky City”, Acoma is considered by its residents to be the oldest continuously inhabited town in America. This can never be proven for certain but its long history is undisputed. 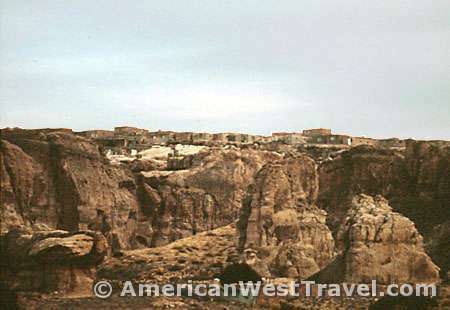 The excellent photo, left, shows a segment of Acoma Pueblo. Those who are familiar with the ancient ruins of the region’s Anasazi people, which date back over 700 years, will immediately see the similarity. The chief visual differences are the modern doors and windows. 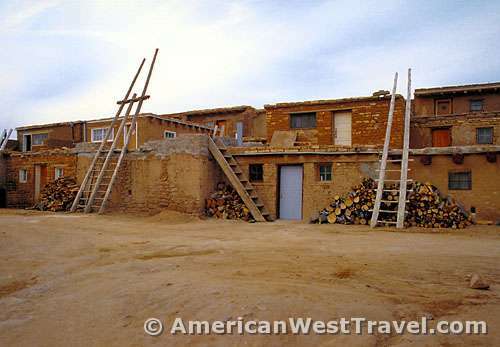 The photo, right, comes from the U.S. National Archives and gives an excellent perspective of the pueblo’s structure. 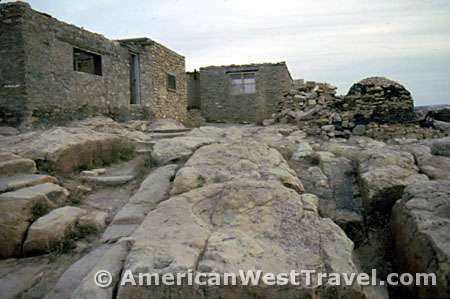 Acoma’s first entry into modern history came in 1598 when its people clashed with the troops of the Spanish governor of New Mexico, Juan de Onate. 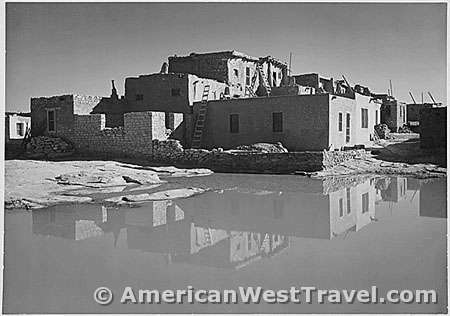 Peace was restored with the construction of San Esteban del Rey Mission within the pueblo. 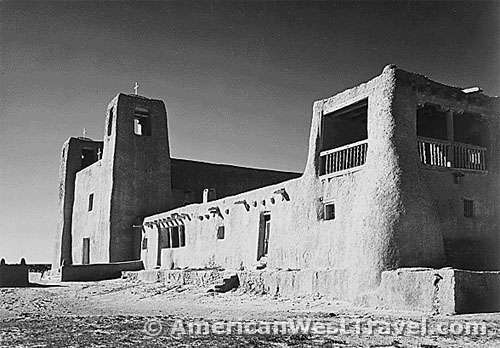 The building was started in 1629 and completed in 1640, making it the oldest Spanish mission in the southwest. We were not permitted to photograph the very beautiful church during our visit. However, the U.S. National Archives image, left, shows the church’s exterior. The pueblo has managed to withstand centuries of conflict and numerous rulers, and continues to stand intact on its mesa top as shown in the photo, right. Perhaps its remote and imposing locale has helped its survival. Only about fifty residents of the Acoma tribe actually live on the mesa top full time. 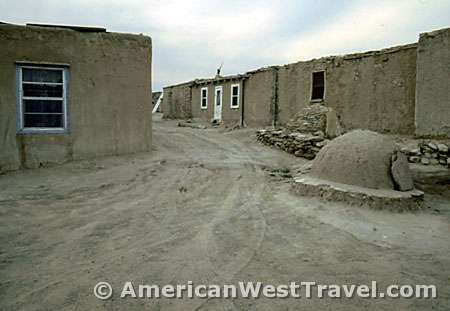 Most others use the ancient pueblo for special occasions like holidays, vacations, or festivals. The rest of the time, they live in modern housing on the desert floor. Perhaps some residents still use traditional methods, such as the horno shown in the photo, left. These beehive-shaped kilns have been used for centuries to bake bread. 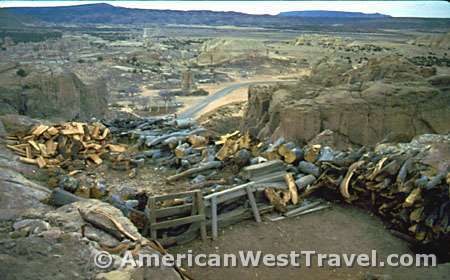 Residents of Acoma also enjoy outstanding views from the top of their mesa as shown in the photos, below. 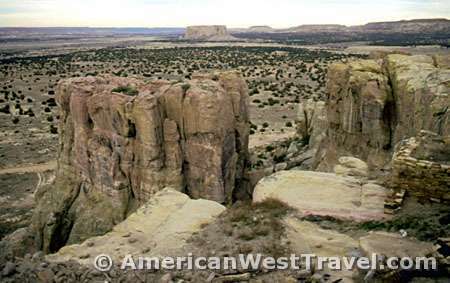 Enchanted Mesa to the northwest is said to be the ancestral home of the Acoma. The Acoma Museum is near the foot of the mesa. Centuries of artifacts including ancient pottery are on display here. Guided tours of the mesa top may be arranged here. You cannot enter the pueblo without a guide. The Acomans are noted for their outstanding pottery decorated in white, black, and orange (of which I am pleased to own one). Local artists offer their wares for sale outside of the museum.